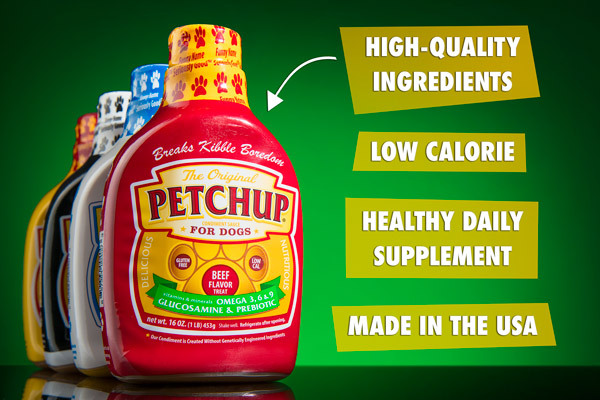 Petchup: Healthy flavor additives for dog food. A good dog deserves a good meal. 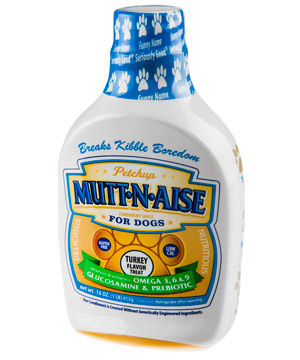 Enhance your best friend’s food with a specially made canine condiment. 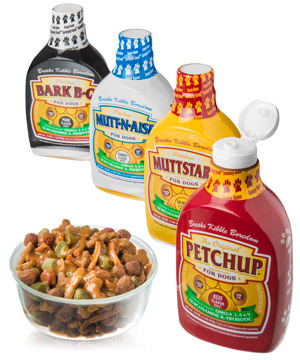 Petchup is a healthy, flavorful addition to your dog’s diet. A small squirt turns your pup’s normal food or water into a tail-wagging treat. In addition to their meat flavoring, these broth-based additives contain all-natural ingredients that promote Fido’s joint and digestive health. Choose from the four available flavors to find the one that pairs best with your pooch’s palate. 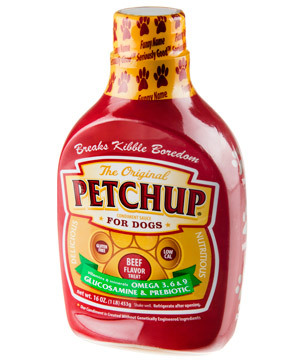 Petchup is a way to enhance your dog’s meal without resorting to sprinkling in some people food. 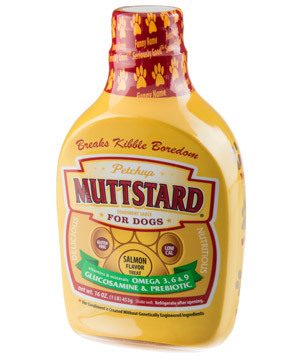 Although the bottles and names are modeled after human condiments, these treats have strictly dog-friendly ingredients. The taste is so good, it’s worth being a good boy. Petchup is designed for any dog of the non-hot variety who has a hankering for more flavor, but it’s especially beneficial for picky eaters and older dogs with joint concerns. If it can make dog food tasty, it must be pretty good. Maybe the reason dogs beg for table scraps is that they’re sick of having the same old dog food for the 3,000th night in a row. 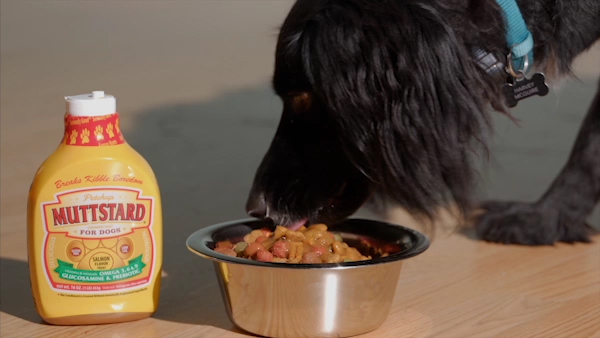 Give your dog’s bland meal a savory squirt of Petchup and bring flavor back into your best friend’s life. These broth-based additives are an easy way to enhance your dog’s dinner. I mean, would you wanna eat a dry hamburger or hot dog? When you’re between meals, freeze Petchup in an ice cube tray and give a frozen treat that’s got a boost of the healthy stuff. Keep your dog salivating like Pavlov's pup. With a day full of chasing squirrels and barking at the doorbell, your dog doesn’t have time to watch its figure or worry about arthritis. That’s why Petchup is full of natural, healthy ingredients that help maintain your furry friend’s quality of life as it gets older. Each flavor of Petchup is low calorie and contains glucosamine to promote joint strength. It’s also prebiotic to promote digestive health and contains no MSG. Even if your dog isn’t aware of their health, they’ll be happy for it later. Petchup contains no artificial colors or flavors. 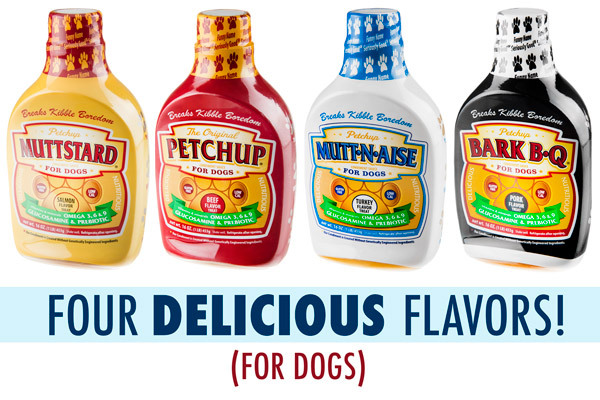 Petchup is available in four flavors for your four-legged friend. 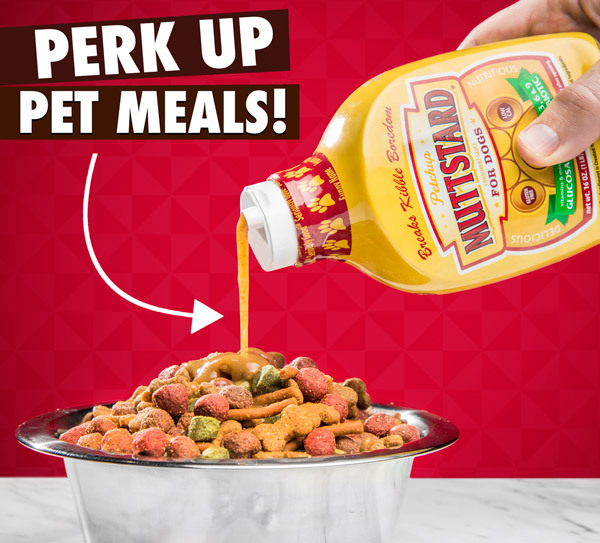 Grab a bottle of salmon-flavored Muttstard, beef-flavored Petchup, turkey-flavored Mutt-n-aise, or pork-flavored Bark B-Q. 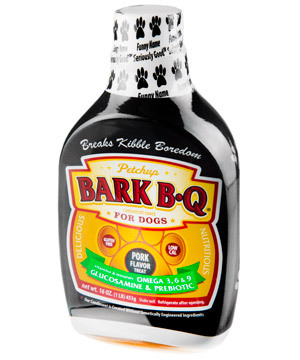 They’re all enough to make your pooch drool over their dinner (even more so than usual)! Question: Can I feed these to my cat or maybe myself? Answer: Petchup is safe to be eaten by non-dog animals, but they probably won’t like it as much as your pooch. Question: How similar are these to actual human condiments? Answer: Petchup’s similarity to human condiments lies mostly in the bottles and names. The ingredients and consistency aren’t modeled after their parodied namesake. Question: My dog won’t eat anything unless he knows what’s in it. Can you satisfy my best friend's demands? Answer: Of course! The ingredients for each variety are listed below. Water, Pork Broth, Dried Sweet Potato, Sunflower Oil, Dried Tomato, Dried Yeast, Xanthan Gum, Citric Acid, Apple Cider Vinegar, Natural Smoke Flavor, Natural Flavors, Glucosamine Hydrochloride (from shellfish), Tricalcium Phosphate, Fish Oil, Magnesium Oxide, Ascorbic Acid, Inulin, Sodium Selenite, Manganese Citrate, Maltodextrine, alpha Tocopherol Acetate, Inositol, Niacinimide, Vitamin A Palmitate, Vitamin B12 Supplement, Pyridoxine Hydrochloride, Zinc Oxide, Riboflavin, Potassium Citrate, Cholecalciferol, and Folic Acid. Water, Turkey Broth, Dried Pumpkin, Dried Yeast, Dried Carrot, Citric Acid, Xanthan Gum, Sunflower Oil, Turmeric, Natural Flavors, Glucosamine Hydrochloride, Tricalcium Phosphate, Fish Oil, Magnesium Oxide, Ascorbic Acid, Inulin, Sodium Selenite, Manganese Citrate, Maltodexctrins, alpha Tocopherol Acetate, Inositol, Niacinimide, Vitmin A Palmitate, Vitamin B12 Supplement, Pyridoxine Hydrochloride, Zinc Oxide, Riboflavin, Potassium Citrate, Cholecalcifero, and Folic Acid. Water, Salmon Oil, Dried Tomato, Beef Broth, Dried Yeast, Xanthan Gum, Dried Green Bell Pepper, Apple Cider Vinegar, Natural Smoke Flavor, Citric Acid, Natural Flavors, Glucosamine Hydrochloride, Tricalcium Phosphate, Magnesium Oxide, Ascorbic Acid, Inulin, Sodium Selenite, Manganese Citrate, Maltodextrine, alpha Tocopherol Acetate, Inositol, Niacinimide, Vitamin A Palmitate, Vitamin B12 Supplement, Pyridoxine Hydrochloride, Zinc Oxide, Riboflavin, Potassium Citrate, Cholecalciferol, and Folic Acid. Water, Beef Broth, Dried Yeast, Dried Tomato, Dried Green Bell Pepper, Citric Acid, Xanthan Gum, Flaxseed Oil, Natural Flavors, Glucosamine Hydrochloride, Tricalcium Phosphate, Fish Oil, Magnesium Oxide, Ascorbic Acid, Inulin, Sodium Selenite, Manganese Citrate, Maltodextrins, alpha Tocopherol Acetate, Inositol, Niacinimide, Vitamin A Palmitate, Vitamin B12 Supplement, Pyridoxine Hydrochloride, Zinc Oxide, Riboflavin, Potassium Citrate, Cholecalciferol, and Folic Acid.